3 Godaddy Email Sign Up. 5 Godaddy Email Login Problems. Log in to your Godaddy email account without any hassle. 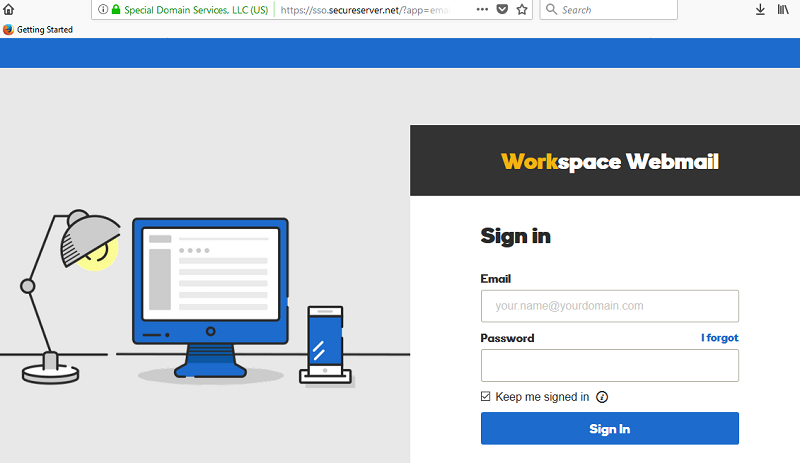 Complete guide to the Godaddy Email Workspace Webmail service, plus help with registration and common Sign In problems. GoDaddy Email is a webmail service, offered to GoDaddy customers, which allows them to set up an email address that matches their domain name. Various different free or paid email options are available from the company, but these options are only offered to those who have already purchased a domain name from them. Originally founded back in 1997, GoDaddy itself is a web hosting company, as well as a domain registrar, which enables its customers to register a web address and also host their website on its servers. It is currently recognised as the largest business of its type in the world, with more than 17 million customers. How do I Register for a GoDaddy Email Account? If you are an existing GoDaddy customer and want a free email address, you can securely register for one by signing in to your main GoDaddy account and then clicking on the link labelled ‘Workspace Email’. From there, beside the account you want to use, click on ‘Manage’, then at the top of the list that is displayed, click on ‘Create’. You will then need to enter the email address you wish to create, as well as a password, which will then be associated with that email address. Once you have done this, click on ‘Create’ and you should see a confirmation message. It should be noted that it can take up to 90 minutes before a new email address becomes accessible. Alternatively, GoDaddy also offers a paid Professional Email service, which includes a number of additional benefits. Customers can sign up for this by clicking here. From that page, click the ‘Get Started’ button, select your chosen plan and term length, and click ‘Continue’. Then follow the on-screen instructions to complete the process. How do I Log In to my GoDaddy Webmail Account? Once you have created a GoDaddy webmail account, you can access it through the main GoDaddy webmail login page, which can be found by clicking here (login.secureserver.net). For those who signed up to one of the company’s Professional Email services, a separate Office 365 GoDaddy webmail login page can be found here. From there, simply enter your email address in the ‘Username’ field, then enter the password associated with that email address in the ‘Password’ field and click the ‘Sign In’ button underneath. Mobile users can access the login page by visiting: https://mobilemail.godaddy.com. Once the page has loaded, the same basic login procedure can be followed in order to gain access to an email account. Always take special care hen attempting to log in to your Godaddy Email account. “Fake” login pages are widespread, so take a few seconds to make sure that you have landed on the correct Sign In page. The official Godaddy Webmail login page should look like the screenshot aboce, and the official URL will begin with https://sso.secureserver.net/ or https://sso.godaddy.com/login?realm=pass&app=email. Are you Having Problems logging in to your Godaddy Email Account? As with any other service of this type, it is somewhat inevitable that users may occasionally encounter issues when attempting to log in. With that being said, most of these problems have a fairly routine solution, so it is simply a case of identifying what the problem is and working through the solution associated. The majority of sign in issues are caused by incorrect login details being entered, so the first step is to make sure you have entered the right credentials. Pay particular attention to passwords, as these are obscured on the screen and are case sensitive. For this reason, you should double check that CAPS LOCK and NUM LOCK are off. Another very common problem occurs when users forget their password. Thankfully, GoDaddy’s email service has been set up with this eventuality in mind. In the event that you have forgotten your password, go to the password reset page, which you can reach by clicking here. Alternatively, click ‘I Forgot’ next to the password field on the login form. Then, simply work your way through the instructions to reset your password and regain account access. Similarly, if you have forgotten your username, you can find it again by visiting the username retrieval page, which can be found here. You will be asked to fill in some basic personal details in order to confirm your identity and your username will then be securely sent to you. If you are sure you are entering the correct login details, you should double check the URL you are using for your sign in attempt. For example, a GoDaddy.cn account may not be accessible from GoDaddy.com. Similarly, mobile users have a different login page, as outlined in the previous section of this guide. Should problems persist, try clearing your web browser’s cache, cookies and history, before trying again. If that fails, you may wish to try signing in using a different web browser. The service should be accessible from all major browsers, including Internet Explorer, Firefox and Google Chrome. GoDaddy’s email servers may occasionally require maintenance work, which could make logging in difficult. When this occurs, the only real option is to attempt to sign in again later on, once the work has been carried out. Please share any help or complaints about the Godaddy Email service below. Thanks for the heads up. I didn’t realize there was a seperate mobile login page. Shou on Twitter LoginVery good, thanks for the help.